Friday's college football slate features two teams on the opposite ends of the ATS standings. 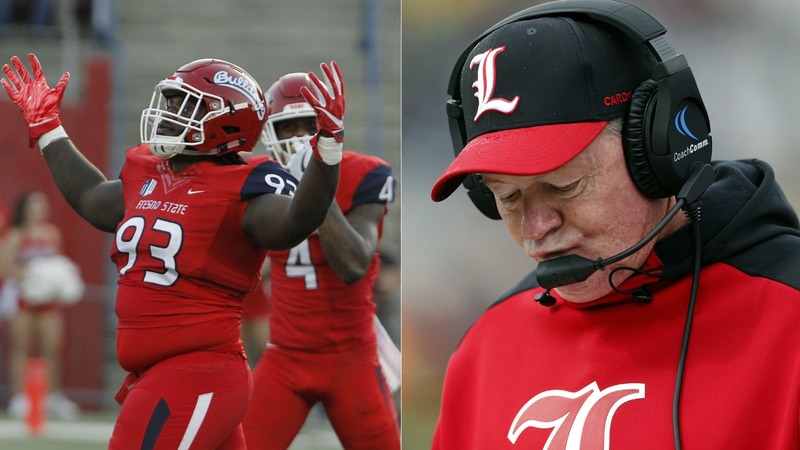 Louisville (1-8 ATS) takes on Syracuse, while Fresno State (8-1) plays at Boise State. Here's a betting breakdown and picks on both games. Friday's college football slate is unique because it features two teams on the opposite ends of the ATS standings in FBS. Louisville (FBS-worst 1-8 ATS) takes on Syracuse as a 21-point underdog, while No. 23 Fresno State (8-1 ATS) plays at Boise State as a 2.5-point favorite. Not only are Louisville and Fresno State different against the number but they are also doing so at an incredible average. The Cardinals are failing to cover by an average of 17.2 points per game, the worst mark in the nation. Louisville is fresh off a 77-16 whipping by No. 2 Clemson in which it missed the cover by 16.5 points. The Bulldogs, on the other hand, are covering the point spread by 12.8 points per game, second only to Utah State. Fresno State is one of only four teams at 8-1 ATS, joining Washington St., Utah St., and UAB. Fresno has climbed the ATS -- and college football ranks -- by being incredibly efficient on both sides of the ball. The Bulldogs are one of only six ranked in the top 25 in both offensive and defensive efficiency. Their solid play, paired with an average Boise State squad has the Broncos a home underdog for the first time since 1999. __MORE:__ [Sportsbooks preparing for Alabama-Clemson Part IV](https://www.betchicago.com/college-football-playoff-rankings-sportsbooks-alabama-clemson) ## Louisville at Syracuse betting lines, odds and pick 6 p.m. CT on ESPN2 __Point spread:__ Syracuse -21 __Total:__ 69 __Line movement:__ The Orange were as high as 21.5 but currently sit as 21-point favorites. BetOnline opened the total at 73.5 but the market currently sits at 69 or 69.5. __S&P+ prediction:__ Syracuse 38, Louisville 22 __Note:__ S&P+ rankings are an advanced data set of tempo- and opponent-adjusted components of the five factors of college football: Efficiency, explosiveness, field position and finishing drives. Per creator Bill Connelly, a fifth factor, turnovers, is informed marginally by sack rates. ## Louisville betting records, stats 2018 SU record: 2-7 2018 ATS record: 1-8 2018 O/U record: 6-3 S&P+ rank: 104 Off. S&P+ rank: 107 Def. S&P+ rank: 103 Special Teams S&P+ rank: 31 ## Syracuse betting records, stats 2018 SU record: 7-2 2018 ATS record: 6-3 2018 O/U record: 5-4 S&P+ rank: 58 Off. S&P+ rank: 41 Def. S&P+ rank: 77 Special Teams S&P+ rank: 1 ## Louisville at Syracuse betting trends Orange are 8-0-1 ATS in their last nine games following a straight up win. UNDER is 11-4-1 in Syracuse's last 16 home games. Cardinals are 3-13 ATS vs. a team with a winning record. ## Louisville at Syracuse pick Staff writer Chris Mascaro has a pick on this ACC contest. Here's Chris: "Someone please explain to me what's motivating Louisville in this game. Without Lamar Jackson, the Cardinals (2-7, 0-6 ACC, 1-8 ATS) have been an embarrassment this season, allowing 77 points at Clemson last week and losing to Wake Forest by 21 as a three-point home favorite two weeks ago. Now they have to travel to upstate New York to play a Syracuse team that could play its way into a New Year's Six bowl with games against No. 3 Notre Dame and No. 17 Boston College still to come. This is the last cookie on the Orange (7-2, 4-2 ACC, 6-3 ATS) schedule, so they're going to make sure to savor it. Syracuse -21 is the play." ## No. 23 Fresno State at Boise State betting lines & odds 9:15 p.m. CT on ESPN2 __Point spread:__ Fresno State -2.5 __Total:__ 54 __Line movement:__ Sharp bettors took Boise State at +3 at the Westgate on Monday and the point spread has been 2.5 ever since. The total has dropped from 54 to 53.5. __S&P+ prediction:__ Fresno State 33, Boise State 24 ## Fresno State betting records, stats 2018 SU record: 8-1 2018 ATS record: 8-1 2018 O/U record: 3-5-1 S&P+ rank: 7 Off. S&P+ rank: 22 Def. S&P+ rank: 8 Special Teams S&P+ rank: 74 ## Boise State betting records, stats 2018 SU record: 7-2 2018 ATS record: 4-4-1 2018 O/U record: 5-4 S&P+ rank: 34 Off. S&P+ rank: 21 Def. S&P+ rank: 51 Special Teams S&P+ rank: 118 ## Fresno State at Boise State betting trends Fresno State coach Jeff Tedford is 18-5 straight up and 19-3-1 ATS (including postseason) during his tenure with the Bulldogs. He improves to 14-0 ATS against conference teams with a winning record. Since 2012, Boise State is just 16-26 ATS in home games. UNDER is 17-7 in Broncos last 24 home games UNDER is 9-2 in Fresno State's last 11 road games. ## Fresno State at Boise State pick Here's our night editor Thomas Casale: "I haven't lost a college football pick at BetChicago in five weeks. I'm 15-5 on the season and currently on a 10-0 run. All of those picks have been on Saturdays, though. This week, I'm rolling with a Friday game. I absolutely love Fresno State here. I've been waiting for this game, figuring Boise State would be overvalued at home. They are, getting less than a field goal. The Broncos are an average football team this season, while Fresno is the top non-Power 5 team in the country. Vinny Magliulo said on VSiN this week that he would make the Bulldogs -3 over UCF on a neutral field. UCF hasn't lost a game in two years. Fresno State's pass defense is one of the best in the nation, holding quarterbacks to a 48 percent completion rate and recording 15 interceptions. The Bulldogs won in Boise last year, and I think they do it again Friday night rather easily. Fresno State -2.5."